Sometimes you can find intriguing new wines, simply by adhering to the wine trail map you picked up at the hotel. It's mid-May and after 6 weeks of travelling Australia visiting over 100 wineries, I am back in South Australia, this time to visit the esteemed Clare Valley wine region, which as I arrive into the Southern Clare town of Auburn I find the place is absolutely abuzz with wine & food lovers from all across the country. This is the annual Clare Valley Gourmet Weekend, a celebration of all things Clare, with great food served on every corner, and wine that is just as tasty, being poured to match. Drifting down the main street, from one wine tasting to the next, I become slowly aware of the melodic strumming of a guitar, paired in time with a gentle harmonious voice, floating over a tree-lined stone wall. Rounding the corner I come across a scene of merriment, the home of Velvet & Willow, a family wine producer based here in the Clare, hosting a lunch and tasting around a little brook and under a grove of trees. Smack dab in the heart of town, yet somehow hidden and private regardless. Approaching the tasting bench I am presented with a range of wines, two of which stood out clearly in my mind long after I retired for the evening. When you come to Clare Valley, Gourmet Weekend event or not, you know it's going to be a Riesling lovers paradise. Clare Valley Riesling is a distinct wine style, recognised the world over, and with the last 40 years of development and focus, that reputation is well earned. Velvet & Willow is far from an exception to this rule, producing one of my favourite Rieslings of the weekend, standing out even amongst dozens of quality example sampled across the valley. That this Riesling tastes so delectable, soon becomes less of a surprise as I learn the fruit for this Riesling was grown in the pristine St Clare vineyard, located in Watervale, Clare Valley's high quality Riesling-hub, located less than 10 minutes up the Horrocks Highway from Auburn itself. The wine itself is a pale pear-yellow hue in the glass, with a delightful 'classic Clare' aroma of wet stones and ripe citrus, following into a crisp, yet generous palate, that speaks to a gentle press during the winemaking process and careful fruit selection at harvest, making sure only the best of the crop made it's way to the eventual consumer. The finishing flavours are of a lingering lime and apple with the first hints of maturity starting to show through as it approaches it's fourth year in bottle. Optimal drinking now through 2020. Also available online & at the cellar door : newly released 2015 Riesling, also sampled and highly recommended. 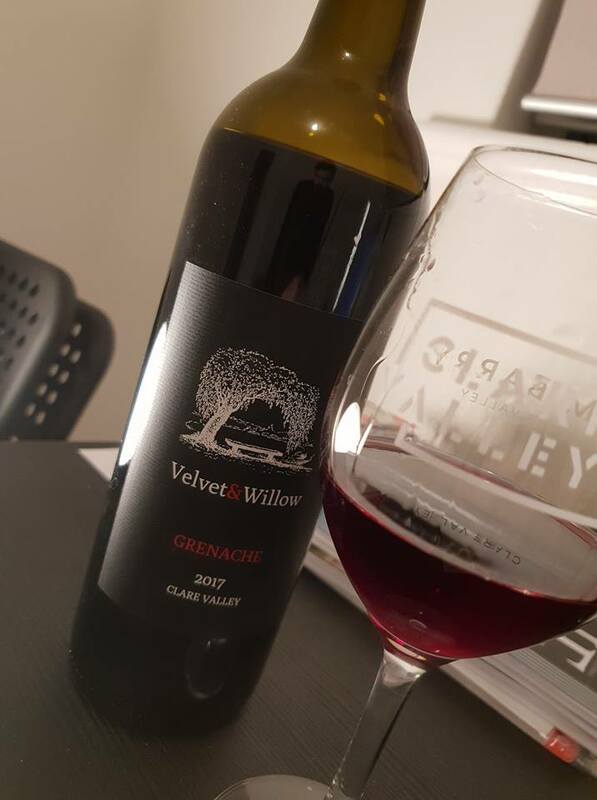 Choosing an appropriate red to go after such a stellar Riesling was difficult, and after sampling Grenache, Shiraz and finally Cabernet Sauvignon, (the later two being well regarded wine styles in Clare), it was actually the Grenache that kept me coming back for more. Even as I speak, I'm sniffing and swirling this delightful wine, and the room itself seems to be full to the brim of raspberries, red cherries cranberries & red liquorice, yet it is a welcome sensory assault, with pretty high notes, and seductive lows playing through the nostrils with every inhalation. In the glass this Grenache is ruby-red with flecks of a purple so bright, it reminds me of Amethyst gemstones, reflecting light in an attractive tone that portrays the playful, yet mature nature of this flavourful Grenache. First sip is fruity with a candied strawberry character that broadens into a palate of well-implemented spices, sweet and at the same time savoury. On the finish, this Grenache continues unfolding until it reveals an almost ethereal softness that relaxes the mind, body & soul (regardless of intoxication level). Optimal drinking now, but should age nicely through until 2021. Consume younger for a focus on the red fruit delights. That's how the new generation are doing it up in the Clare Valley, with finesse, style and plenty of flavour. So next time you find yourself in South Australia, give the fine folks at Velvet & Willow a call to taste these delicious drops. Who knows, perhaps I'll see you, at next years Clare Valley Gourmet Weekend! If you can't visit in person, check here for a list of stockists around Australia or simply order online. To learn more about the Clare Valley and other nearby wine producing areas, head here to check out my South Australian Wine Region breakdown.